How big is the Universe? How are objects in the Universe arranged with respect to one another? How does this size and arrangement change with time? Why are these properties the way they are? Where did the universe come from and where is it going? These are the questions cosmologists, among them my colleagues at Queen Mary, grapple with every day. The final question raises the possibility that the Universe had, in some sense, a defined beginning, and may have a defined end. In turn this always reminds me of the above quotation from Shakespeare, and of the very human desire to understand our origins and fate. Cosmology is the ultimate scientific search for this understanding. 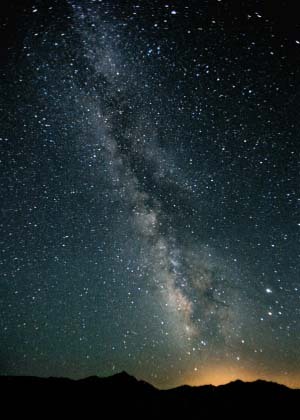 Figure 1: The night sky, as seen from inside our galaxy. Image: jpstanley. Indeed, understanding the Universe we live in has been a preoccupation of human societies for as long as they have existed. But since the time of Einstein, a physical model of the Universe has emerged, based in the main on his general theory of relativity, in which the Universe "began" in a hot dense state and then expanded and cooled for 14 billion years into the one we see around us today. The model is incomplete, and furthering our understanding of it, as well as probing its limits, is what modern research in cosmology is all about. In this short article I'll try and tell you some answers to the questions I opened with, and along the way explain the limits to our knowledge, and how Queen Mary's cosmology group is helping to fill in the gaps. The Universe is extremely large, so large it's difficult to comprehend without considering some kind of a scaled comparison. On a dark night, away from streetlights, look up at the night sky filled with pinpricks of light (see figure 1). With the exception of just one or two of these dots, each is a star inside our galaxy. Stars themselves, like our own Sun, are big objects many times the size of the Earth, but there are hundreds of billions of stars in our galaxy each separated by light years from its nearest neighbour. If we considered one of these stars, and the solar system surrounding it, and shrunk it down to the size of a grain of sand, our galaxy would be the size of a beach stretching for miles. And this is just one galaxy. In our observable Universe there are hundreds of billions of galaxies. To comprehend this scale, we can use the same analogy again, but now take an entire galaxy and shrink it down to the size of a grain of sand; the observable universe is then like the beach on which it sits. 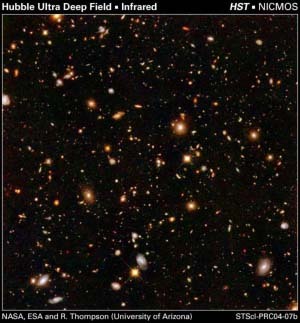 Figure 2: A Hubble space telescope image of a small fraction of the sky. Many, many galaxies can be seen. Image: NASA, ESA, and R. Thompson (University of Arizona). Many studies have been conducted, and are ongoing, to observe and catalog all the galaxies we can see, producing beautiful and awe inspiring images and informing us about how they are structured and evolve with time (see figures 2 and 3). Cosmologists are interested in the collective structure and behaviour of all these galaxies (or a large fraction of them) as a single entity. Each galaxy interacts with every other through the force of gravity, forming a gravitational field that connects them and permeates the Universe. Physicists understand this field using Einstein's theory of general relativity. In general relativity mass and energy produce the gravitational field and interact with it. The exact form of the gravitational field is determined by the arrangement of the matter/energy. We therefore expect the Universe, made up of all these galaxies and the field that binds them, to exhibit collective motion; for example, the average distance between the galaxies can grow or shrink. So what does our Universe look like and how does it change with time? A remarkable property is that out of all the complex possible ways of arranging the galaxies that make up our Universe, nature appears to pick the simplest possible option. When we look at the Universe on the largest scales, it is on average very smooth and similar looking in every direction. If we broke the observable Universe into many equal sized blocks, and asked how many galaxies are in each, we would find roughly the same number. We conclude that the Universe is on average the same everywhere. One can think of the galaxies and clusters of galaxies stretching out from us in every direction, and on average evenly spread, as far away as we can see. If we moved from our position to a very distant one and looked again at the Universe surrounding us, we would expect to see roughly the same thing. The exact galaxies would be different but the arrangement would be very similar. This property is called isotropy and homogeneity, and why the Universe looks like this is still an active topic of research I'll return to later. Figure 3: An image produced using data from the 6DF galaxy survey. Every point in this image is the position of a galaxy, with us at the centre. If an alien living in one of these distant galaxies made this image, it would look extremely similar — every point in the universe is on average the same. The dark black wedges are empty because no observations could be made, not because galaxies are not present in these regions. Image: 6DF galaxy survey. Another remarkable discovery made in the 20th century by Edwin Hubble was that when observing on the largest scales, distant galaxies all appear to be moving away from us. In our model where every point in the Universe is equivalent to every other, this implies all points are moving apart from one another. The distance between all points in the Universe is increasing with time in proportion to the distance they are apart. A two dimensional analogy of this behaviour can be constructed by drawing tiny dots on the surface of a balloon, and then blowing it up — each dot moves away from every other at a rate in proportion to their separation distance. This behavior, together with the smoothness of the Universe, is consistent with a particular form for the gravitation field that changes over time. This form, in combination with the matter arrangement, is described by Einstein's theory of general relativity. Named after its discoverers, it is called the Friedmann-Lemaitre-Robertson-Walker (FLRW) solution, or sometimes simply the FLRW model. This solution to Einstein's equations also has some disturbing consequences for our past. If we wind the clock back, all points in space were closer and closer together, and the Universe was hotter and denser, until at a particular time roughly 14 billion years ago, all points were on top of one another — this is what is called a singularity. We often refer to this point as the beginning of the Universe, or the big bang. Really, however, singularities simply indicate that Einstein's theory is failing. They represent points beyond which we can't predict what happens using that theory. At or shortly before this cosmological singularity, therefore, Einstein's laws can't be trusted anymore, and must be replaced with a new theory. This theory is called quantum gravity, but how it works and its impact on cosmology is another open question I'll mention again later. Figure 4: The cosmic microwave background. 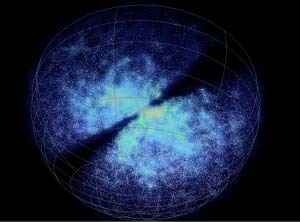 This is a map of light which has been travelling to us since the early Universe, when the Universe was hot and dense. The map shows us the Universe at this time looked almost exactly the same everywhere. Image: the Planck mission. There is considerable evidence for the hot dense origin of our Universe described by the FLRW model. 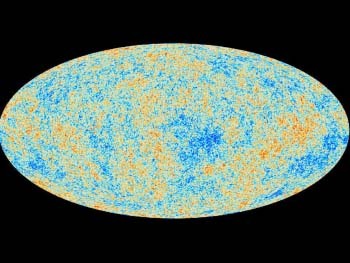 Not least is the light we observe coming from a few hundred thousand years after the beginning, called the cosmic microwave background (CMB), which was forged in a hot thermal bath (see figure 4). This light in turn is evidence for the smoothness of the Universe. In fact, it indicates that the early universe had a temperature that was the same everywhere, up to small differences at a level of one part in one hundred thousand. So our picture of the Universe is of a roughly even distribution of matter, extending as far as we can see, with every point moving away from every other, and that this state gradually evolved from a hot and dense distant past. What then will happen in the future? Will the Universe keep expanding? Or will it eventually re-collapse and contract towards another singularity? Both types of fate are possible within the FLRW model. 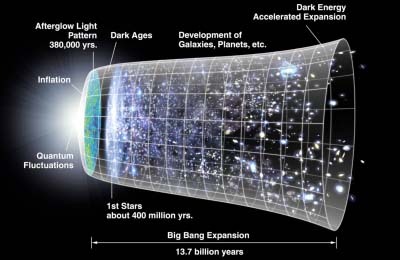 Figure 5: A timeline for the evolution of our Universe. Image: WMAP. To answer this question we need to know how much matter is in the Universe and of what type, as this affects the expansion rate, and whether the pull of gravity is able eventually to overcome the expansion and cause objects to start to move back towards each other. We know about the galaxies we can see, but what else is there? There is certainly some radiation — although this turns out to only account for a tiny fraction of the total mass and energy in the Universe today — but what else? When cosmologists have measured this, they have found something rather odd. Only five percent of the Universe today turns out to be the luminous part of galaxies, 27% is something we refer to as dark matter, since gravitationally it behaves in a similar way to the matter we are used to, but must be of a kind not yet found on Earth, even in particle accelerators. Then nearly 70% of the energy density of the Universe is made of something even weirder, called dark energy. This is a form of matter also not directly detected on Earth, and which has odd gravitational behaviour. Rather than causing objects to attract each other, it pushes them apart. Observing the most distant objects in the Universe we find that not only are they moving away from us, but that today the rate at which they are moving is accelerating. We don't think this was always the case; expansion was decelerating in the early Universe. But a further property of dark energy is that its influence becomes greater as the Universe gets older, and within the last few billion years it has come to dominate. It seems, therefore, that our Universe's fate is to continue to grow at an ever-increasing rate forever. The history of our Universe is summarised in the famous image shown in figure 5. Exactly how the percentages of types of matter are worked out is quite complicated, and would be an article in its own right, but suffice to say this has been done extremely carefully, using many complementary observations — including those of the CMB, of large scale structure, and of distant supernovae. Recall that looking further away in the Universe corresponds to looking at it at earlier times, since light travels to us at a finite speed. Through observations, therefore, we can build up a picture of how the Universe has evolved, and interpret this within the context of the FLRW model. The Universe we find ourselves in has some deep questions still to understand. What are dark energy and dark matter? Why is the Universe smooth on the largest scales, and how did structures or clumps of matter (galaxies and clusters of galaxies) arise on smaller scales? What happened close to the singularity where general relativity breaks down, and what theory replaces general relativity at that time? Is Einstein's theory correct on the largest scales, and is the FLRW solution to it we use to model the Universe the correct one? These are the questions current research in cosmology and related fields tries to answer. 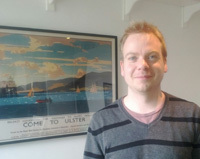 Born in Belfast, David Mulryne is a postdoctoral researcher at Queen Mary, having previously worked and been educated in a combination of Queen Mary, Imperial College London, and the University of Cambridge. He has worked in the field of cosmology for the past 10 years. When not thinking about the Universe he can usually be found cooking or playing hockey.